Pregnancy is a beautiful period in a woman's life. Every woman wants her baby to be born healthy and active. Smoking during pregnancy is usually not advised. 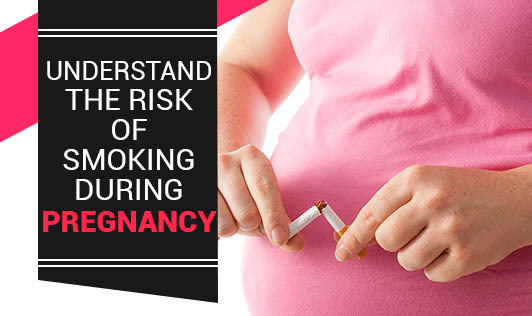 Smoking during pregnancy has many ill effects on your health and on the growing baby's health. Some of the ill effects are: You might get a sudden abortion. Your body needs will increase with respect to nutrition during pregnancy. Due to smoking, nutrient absorption may not be possible and you may end up in malnutrition. There might be vaginal bleeding, placental tear, and sudden death. With respect to your baby, it might be born with disabilities in limbs, hands, muscles, skin etc. It can be a low birth weight baby or even a pre mature baby. This happens because the oxygen supply is hindered and carbon monoxide is produced by blocking the nutrients that should reach the baby. In the process, it tears the placenta of the mother and leads to vaginal bleeding. Even after birth, the child can suffer from obesity, asthma, respiratory problems; the child may even face sudden death. Passive smokers: Passive smokers or second hand smokers i.e. who inhale carbon monoxide from smokers. Even if you are a passive smoker, the effect will be the same or may be even high sometimes. Passive smoking mothers will also face similar consequences. It is better to quit smoking to help your child lead a healthy life!